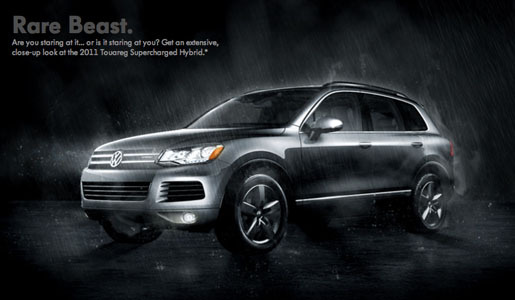 Volkswagen is promoting the 2011 Hybrid Touareg in an advertising campaign centred around the concept of a “Rare Beast”. 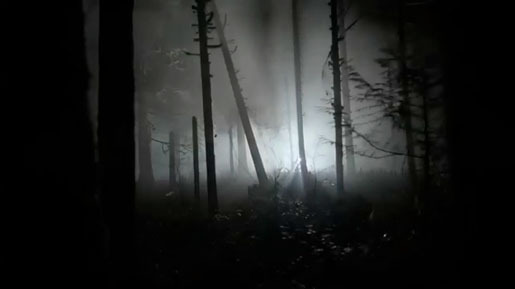 Launched on smartphones and online at vw.com/hybrid, the campaign includes two videos, “Rare Beast Origin”, a mysterious 60 second commercial, and “Rare Beast Habitat” a 3 minute demo Volkswagen Motorsport driver Ryan Arciero. The Rare Beast campaign was developed at AKQA, Washington D.C., by creative director Ginny Golden, associate creative directors Nick Strada and Jefferson Liu, art director John Whitlock, creative strategist Christine Sheehan, agency producer Scott Little, account directors Laura Breines and Katie Fouts, and account executive Erin Chandler. Filming was shot by director/editor Robert Groenwold via Boxer Films with director of photography Tim Hudson, producer John Quinn, executive producers John Clark and Beth George.